I hope this message finds you well. It’s that time again! As we know beauty trends are constantly changing and my job as your stylist is to make sure you're not only standing out from the crowd but staying ahead of the trends too. So the next hot look is "Goddess Twist". 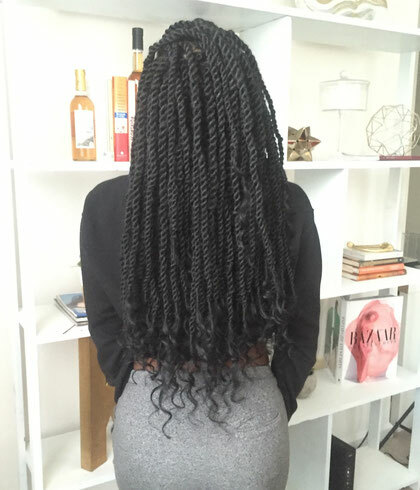 This style is a cross between Marley twist and Goddess locs. It has the seamless twisted roots like Marley twist but with the effortless curly ends like Goddess locs . This style can last anywhere from 4-6 weeks depending on care and new growth. I highly recommend this style if you’ve got a vacation coming up! Guaranteed you’ll be the only one rocking this style. I know you're wondering, "Kia, how long do I have to sit?" Install isn't bad only 4-5 hours :-D. Here's a link to my calendar. Book when you're ready! Last thing, if you or a family member has a business you would like to promote please send me a description of the business/ service with contact information, pictures, social media, or your website so I can share it with my clients. Or if it's easier please leave your business cards in the shop on your next visit.